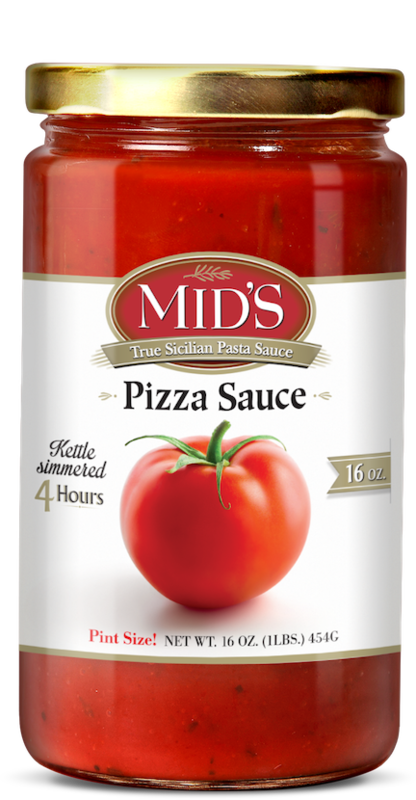 When your pizza deserves only the best, bring home the Mid’s Pizza Sauce. Simmered for four hours in open kettles — the authentic Sicilian way — Mid’s Pizza sauce is a robust blend of fresh herbs and imported spices sure to please. Only the freshest tomatoes are used to craft this thick and rich, all-natural, gluten-free sauce. Your family will forget all about delivery pizza, because with Mid’s Pizza Sauce, your homemade pizza will earn 5-star reviews! Ingredients: Water, Tomato Paste, Sugar, Salt, Olive Oil, Onions, Garlic, Citric Acid, Spices and Oregano.